Walt Disney World Star Wars Weekends (SWW) are galactic weekend events that are filled with fantastic family fun. With a little planning you'll feel the force without feeling the dark side and enjoy the weekend! Touring Tips: Arrive as early as is physically possible. You may hear this suggestion often for touring the parks but for Star Wars Weekends (SWW) it is really important. Skip the big resort breakfast for a quick meal. Fans line up at the crack of dawn. If you have a car this is the day you'll want to use it. One morning our bus from Disney's Saratoga Springs Resort and Spa was 40 minutes late. This put us at the back of the wild and crazy pack of fans entering the park. We arrived in time to enjoy the Stormtroopers entertaining the crowds. If that’s not your thing then head straight to Star Tours 3D ride for a FP and then join the que. If you’re lucky your first ride of the day will be Star Tours 3D. 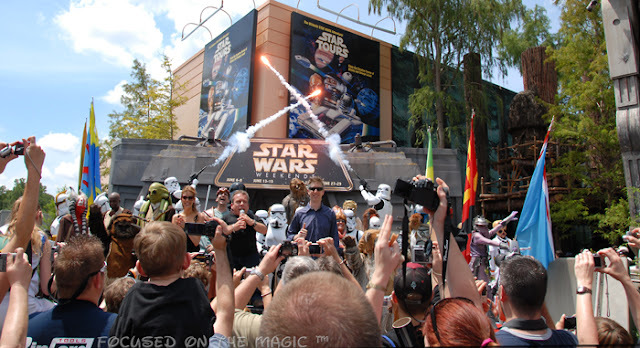 The Star Wars Weekend guide is a valuable planning tool. Pick one up as soon as you reach your resort. Review it ahead of time. As you will see from the map, the park is loosely divided into two different experiences. 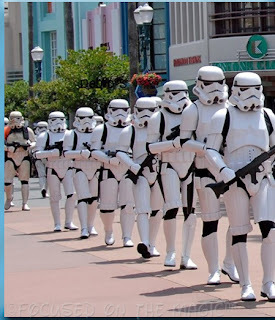 The "dark side" or the "bad guys" are at the back of the park. These would be the most notorious of all the Star Wars villains. The "good guys" can be seen toward the middle to front of the park. For example, Minnie Leia and Jedi Mickey would be found in the front of the parks in meet and greet areas. This was designed so youngsters who are fearful of Darth Vader and the villainous characters don't have an unexpected scary encounter. Another example of Disney event coordinators planning for the best possible experience for all ages. Of course my sons head for the back of the park, right away. There you'll find character meet and greets, encounter Stormtroopers interacting with the crowd, signing autographs and posing for pics. Peter brought his Star Wars trading cards for them to sign. A fun and different souvenir. PhotoPass Photographers (PP) are available throughout the park. Hand them your camera, they’ll take your pictures using your camera. A few good shots from your own camera can save you $ when it’s time to order prints. You can always add your pics to the PP CD later when you order it. Be sure to check your camera settings after PP have used it. It’s happened too often that settings needed to be reset. Stop by Jabba's Hut, for special SWW merchandise. Each weekend 2 pins are introduced and in limited quantity. Shop early for limited edition numbered items, they go quickly. Or, as we did shop late and leisurely after the rush is over. SWW shirts and a limited amount of merchandise is available in the Backlot kiosk but not throughout the park. I bought a few Star Wars shirts before we left home. They were 2 for $9.99 on sale (and I used a coupon:) at Kohl's. We were approached many times by Guests asking where they could purchase shirts like ours. Of course you can shop at Tattoine Traders after exiting the ride. New merchandise is often in limited supply even though they replenish constantly. If your size isn't out, ask. A Cast Member will gladly look in stock for you. 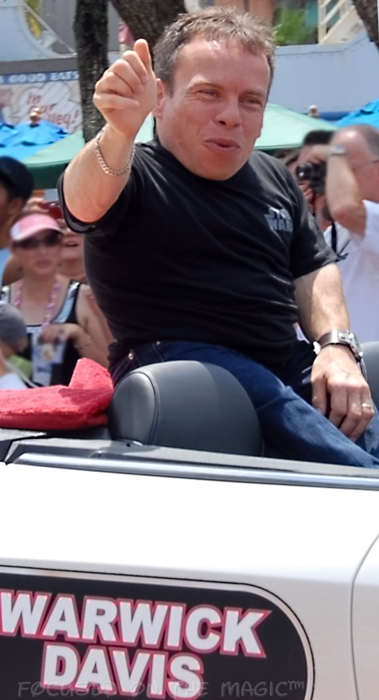 The Celebrity Star Wars Motorcade Parade is a must-see. Find a spot in the shade along the curb and behind the tape. Mind where the sun is in the sky. If you're in that spot you shouldn't be shooting into the sun. 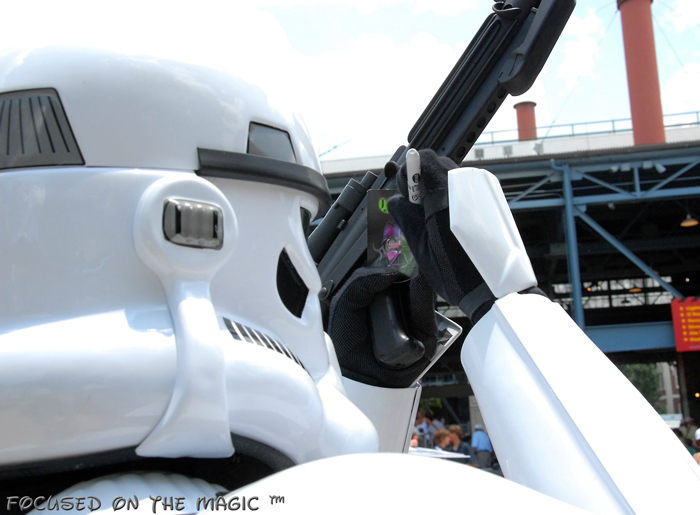 Text STAR2 to DPARK (37275) to receive tips and real-time updates while you are in WDW! 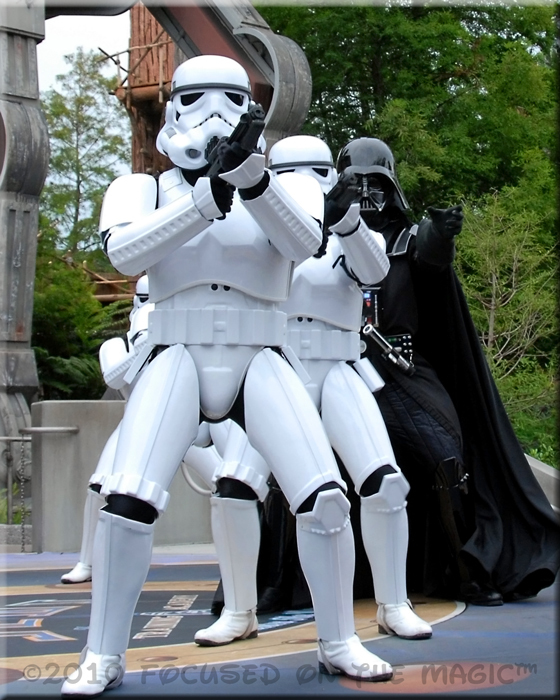 Photo Tip: Don't miss Darth Vader and his Stormtroopers characters at the "Hyperspace Hoopla" dance party at the close of the day. It is out-of-this-world entertainment! Here's a lil vid (not big enough to be called a video:) that DS, Peter took with his little Nikon 3100 point and shoot camera. There's no sound, it's wobbly but you get the idea. Hum if know the tune to Thriller, don't worry it's only for 30 seconds! 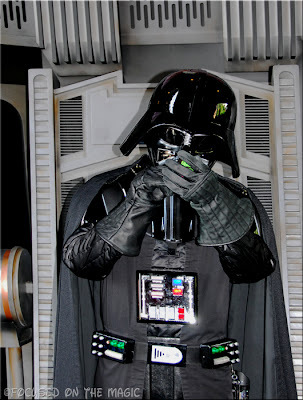 We'll be revisiting Star Wars Weekends in posts to come so, please be sure to stop back. 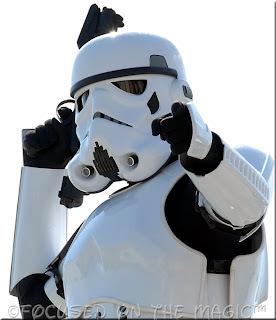 I'll leave the light on for ya' ºoº May the force be with you!